It was a big man sitting in front of the empty locker, but one with the heart of a little kid. "I don't have anything against the management here in Keokuk. I hoped I could find a role to play here. I couldn't. I sure would like to catch on somewhere. I know I can help somebody this season." 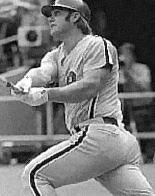 Greg Luzinski, the odd man out in a system built around pitching and defense, was released today by the Westerns after efforts to trade him on the eve of Opening Day failed to bear fruit. "He's a good kid, good bat. There just wasn't anything for him to do here," said manager "Itchy" Jones. "Watson gives me the right-handed slugging, and I've got left fielders all over the place. Poor kid, he just can't cover the ground in a big field like ours. I wish him luck, I really do." To fill his spot on the 35-man roster, bespectacled corner-fielder Chick Hafey was signed to a minor league contract by Keokuk. Without saying so, Jones obviously hopes Hafey will be a little less overmatched in the pea patch than his predecessor. With a rifle arm honed at the oddly-configured Baker Bowl, Jones won't be afraid to let Hafey put down the ash and pick upthe leather.